Massive floods in Iran killed at least two dozen people and injured hundreds more, local officials have confirmed, an event that the country’s energy minister blamed on climate change. 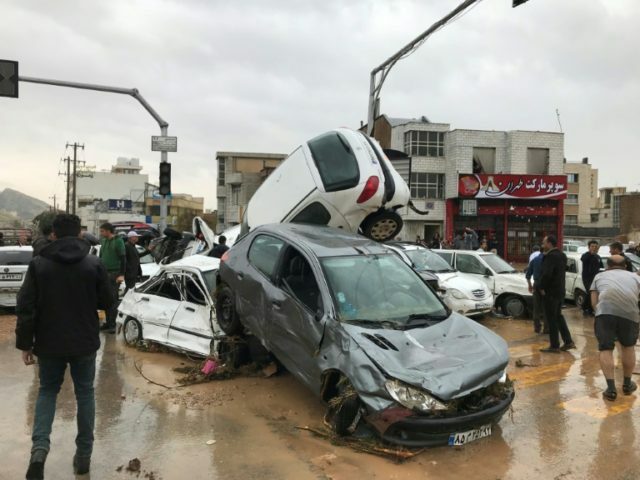 Dramatic footage posted across social media shows muddy water surging through the city of Shiraz where a majority of the lives were lost. The floods have reportedly affected 28 out of 31 provinces, including the capital of Tehran, wreaking havoc across the country. According to the country’s health ministry, at least 110 people were injured as a result of the flooding, while over 25,000 had to be put up in emergency accommodation. Iran’s energy minister, Reza Ardakanian, blamed the events on climate change. Meanwhile, Iran’s crisis management committee sent out multiple text messages to all mobiles in Iran on Wednesday urging people to remain cautious and await instructions from authorities. “Remain calm when facing possible dangers… do not honk your car horns in mountainous regions as it might cause avalanches,” one of the messages read. “Do not set up tents near rivers or mountainous areas… and most importantly do not cross bridges when floods are running underneath. Supreme leader Ayatollah Ali Khamenei issued a message of condolence on Wednesday, urging officials to accelerate relief efforts and compensation for victims. However, many people have criticized the government’s ineffective response to the situation, with many relief workers absent because of the national holiday, an issue the Iranian judiciary has pledged to investigate. “Any shortcomings regarding the handling of the floods, failure to provide relief and aid to the survivors will be investigated,” said judiciary chief Ebrahim Raisi.